When you are fearful or anxious about something, it sure is comforting when someone gives you a reassuring hug or a cuddle. This is also true of our canine friends, although their anxiety is slightly more complicated and can be triggered by many situations, from behavioral to situational. When anxiety strikes your dog, she could be lucky enough if you are around to give her a reassuring cuddle. Unfortunately, you might not be around all the time and this can be distressing for her. Worse, she might start to tremble, vomit, run away, or suffer urine accidents, not to mention the possibility of licking or biting her paws or tail, which could result in serious skin lesions. 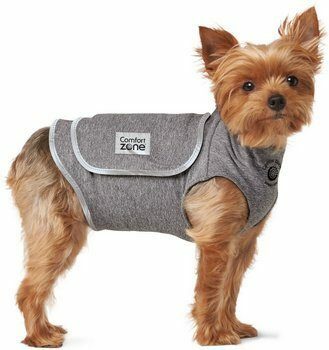 That's where calming vests for dogs come in as they can greatly help to alleviate some of that anxiety from your pooch. Granted, there’s no single one-size-fits-all effective treatment for anxiety in dogs, but anxiety vests could be a great place to start. 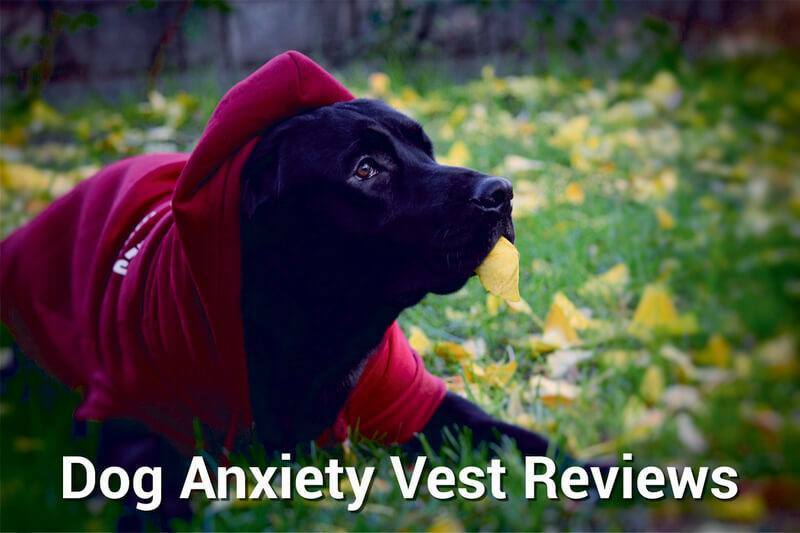 Farther on in the article, I’ll let you in on my dog anxiety vest reviews. For now, let’s find out when these vests are important and how to choose one. When Is A Dog Anxiety Vest Important? Just like humans, canines are very different and every pooch has to be considered as an individual. 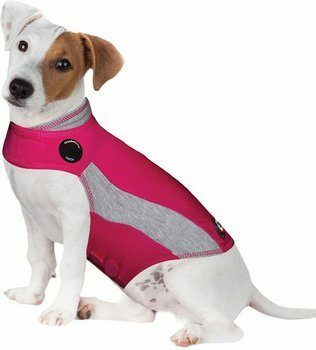 But an anxiety coat for dogs can effectively handle some of the more common and severe anxiety issues. Examples include an anxious response to certain objects, travel anxiety, being left alone, and aging. It's always advisable to seek the intervention of a vet when you see some of these red flags pop up in your mutt. This will ensure proper diagnosis and treatment. Often, a calming vest for dogs may be one of your vet's recommendations, depending on the severity of your dog's anxiety. Although there are several types of calming vests for dogs, the considerations more or less overlap each other. This a key factor to consider as it is the compression that helps your pooch feel calm, as if someone were giving her a hug. It’s recommended that the vest be a snug fit. Some vests may have velcro or buckles while others may have none. Nevertheless, the most important thing is that they be as easy as possible to wear and have a means of fastening around the torso for a snug fit. Just as the name suggests, a swaddle vest hugs your dog’s body, compressing the chest and waist. Check to see that the fastening mechanism is the kind that works perfectly because that’s what allows you to fasten the vest for that swaddle effect. Swaddled babies are less likely to feel anxious; the same rationale applies to your pooch. Weighted blankets have been used on humans to help with anxiety. A weighted vest that fits snugly on your pooch can enhance a sense of security, helping her stay calm when she has it on. However, it should not be used on puppies as it may affect their skeletal development. But for a grown-up dog, it might be a viable option. If your pooch has just undergone surgery, this is usually a good option to help her feel less anxious plus it also serves to prevent her from licking the area operated on while at the same time protecting it from other curious doggy friends..
As promised earlier, I will now take you through some dog anxiety vest reviews, all of which are based on what doggie parents and vets have been raving about. Most dogs respond differently to dog anxiety jackets. 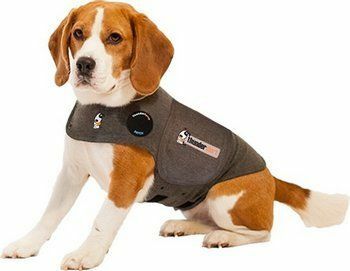 ThunderShirt’s Classic Dog Anxiety Jacket, in particular, has a success rate of 80% of dogs responding favorably to it. Therefore, it’s likely that it might just work for your pooch if she usually goes bananas with anxiety when thunder, fireworks, or any loud boom goes off. Also, this thunder vest would be the best you can use to keep your pup calm and manage her different sorts of anxieties such as separation, car and air travel, licking, and storms, just to name a few. 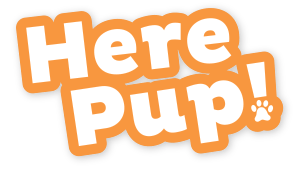 The patented design is easy to get on your pooch and fastening is equally effective for a snug fit that applies gentle constant pressure to all the right spots, similar to swaddling a baby. This is sure to have your dog feeling calmer and secure despite the anxiety triggers. If you’d love to get one for your dog now, look no further than chewy.com for the best offers. Over-excitement in your pooch can be set off by a myriad of issues, the most common ones being thunder, loud sounds, separation, and vet visits. The fortunate thing though is that you can manage such conditions better through the use of a tested and proven anxiety vest like the ThunderShirt Polo Dog Anxiety Jacket. You will realize that the design of this particular vest is very popular and for good reasons. One is because it’s easy to get your pooch to wear it with no fuss. The second reason is the fact that she can't take it off that easily because of the way it is fastened. Plus, she’s likely to get accustomed to wearing it fast. What’s more, this vest has a snug fit that applies a gentle but firm compression, giving your pup the impression that she is being held. It has the same calming effect on your pooch as a swaddle which relieves a baby's anxiety. Even better, you do not need to medicate your pooch when using this anxiety vest nor is any training necessary. 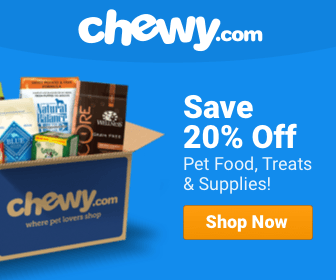 Get yours today by ordering from authorized online pet stores like chewy.com. Calming coats can easily become your dog's best friend. This is because of their portability and the fact that you can instantly create safe environments that reduce your pooch’s stress levels by simply getting her to wear it. AKC’s Calming Coat for Dogs wears pretty easy, thanks to the fuzzy straps that allow you to fasten it around your pooch's torso for a snug fit that helps her feel safe around new visitors, thunder, travel, and many other situations that could cause anxiety in your little buddy. Also, the coat works magic for dogs that are prone to separation anxiety or getting overly excited unpredictably. Washing it is also easy, thanks to the machine-washable fabric it’s made from. At the moment, this coat remains the best separation anxiety jacket for dogs available on chewy.com and other well-known online pet stores. Getting this anxiety vest on your pooch takes only three steps, thanks to the adjustable and flexible fabric wings. Actually, it’s this fact that makes it one of the simplest anxiety vests around. 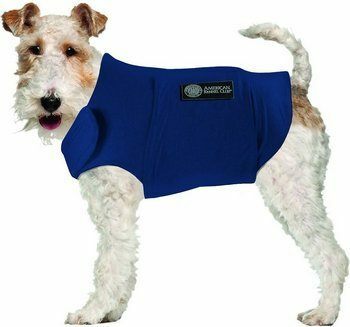 Comfort Zone Calming Vests utilize a sophisticated technology which enables them to effectively swaddle your pooch with constant but gentle compression that helps her calm down. Also, your pooch can comfortably keep it on for long periods because of its soft, flexible, and breathable fabric. On top of that, it’s also equipped with reflective piping on the sides for enhanced safety when walking in poorly lit areas outside. You can have this cool anxiety vest at a fair price by shopping for it at chewy.com. One of the things I find pretty special about the ZenPet Calming Compression vest is it’s designed to generate pressure on certain parts of your pup’s body that are known to soothe and calm your anxious pooch from situations that set her off. Any stressful situation you can think of, be it thunderstorms, travel, or a visit to the vet, won’t be a problem when she has this vest on. What’s more, it’s made of a four-way stretch fabric that is soft and breathable for maximum comfort. Also, it’s easy to secure the flaps around the torso for the right fit around the chest and belly. Never mind that your pooch could be too big or small for this vest because you can choose from six different sizes. ZenPet ZenDog Calming Compression Dog Shirt is available at chewy.com. As a dog parent, I find it comforting when I’m able to provide some sort of solution to my pup’s unpredictable anxieties. It even feels more rewarding when I see her calm down as a result of the vest. I’ve heard fellow pet owners say the same too and I believe you also are no exception. It is worth mentioning that all the above anxiety dog vests are machine washable which makes it easier to maintain hygiene. 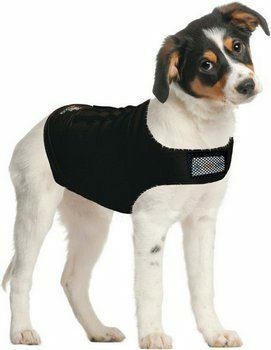 You may not be able to completely control the events that trigger your dog's anxiety, but with the above calming vests for dogs, you now know that you can control and keep your mutt calm.